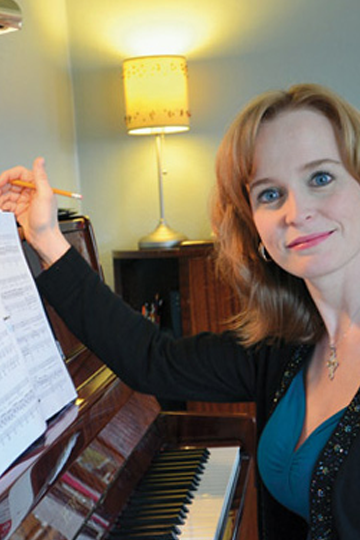 Mezzo-soprano Melanie Adams is a prominent member of Vancouvers music community as a solo and ensemble performer and as a teacher. As a soloist, her repertoire ranges from early music to world premieres of new music by prominent Canadian composers. She has collaborated with many musical and theatrical organizations, including the Erato Ensemble, the Pacific Baroque Orchestra, the Vancouver Island Symphony, Fugue Theatre, Redshift Musical Society, Vancouver Pro Musica and The Opera Project. Most notably, recently she created the dual role of Margot/Amelia McGillen in the world premiere of Supernatural Noir, and she created the role of Spirit of the Maple Tree in the world premiere of Shadow Catch. She was also the soloist in the world premiere of Nerakhoon by Howard Shore, as part of Ottawas Music and Beyond Festival in 2011. Melanie is also very well-known as a long-time member of Vancouvers musica intima, with whom she has toured extensively in Canada and the United States, as well as France and Ireland, and has appeared on 6 of their 8 recordings. Since January 2012, she has also been a member of the Vancouver Cantata Singers. Teaching is also a very important facet of Melanies career. In addition to being the Vice-President of the Vancouver chapter of the National Association of Teachers of Singing, she is also the NATS District Governor for the province of BC. She currently is on faculty teaching voice at the St. James Music Academy on the downtown Eastside, and teaches from her private studio in New Westminster.